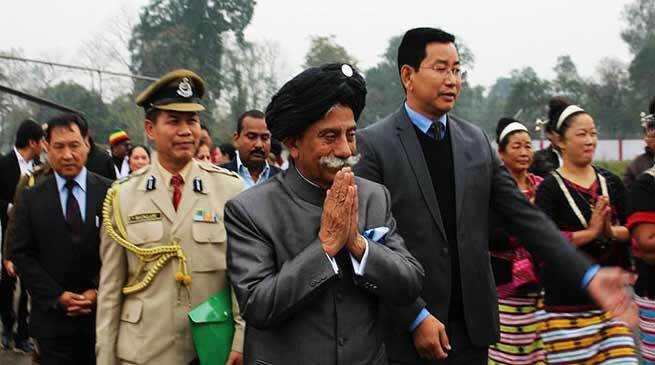 The Governor of Arunachal Pradesh Brig. (Dr.) B.D. Mishra (Retd.) on his two-day visit to Namsai district, addressed a public meeting at Namsai on 10thFebruary 2018. The Governor called upon the people, particularly, the Goan Burahs, Panchayat members and political leaders to join hands together and fight against drug menace and gun culture. He advised them to be proactive in this regard and should not leave it in the field of Government alone. Each one of us should move forward in breaking the peer group addiction links, there should be close supervision of the children at home be parents and cooperate with district administration and police in their campaign to destroy poppy cultivation. Parliamentary Secretary Planning and local MLA C.Z. Namchoom, Namsai Deputy Commissioner Shri R.K. Sharma, Senior Superintendent of Police Shri C.K. Mein and Shri C.K. Munglang, Zilla Parishad Chairperson, Gaon Burahs, Members of Panchayati Raj institute and Tai Khampti Singpho Council, NGOs were present on the occasion. Continuing his practice to visiting healthcare facilities and educational institutes for having firsthand knowledge of the basic amenities in the districts, the Governor visited Govt. Higher Secondary School, Namsai and Community Health Centre, Namsai. Interacting with the students of Govt. Higher Secondary School, Namsai, the Governor said that the fold, which can take the society forward is the student. With high sense of nationalism, knowledge and innovation amongst the youth, the nation will prosper. It is the duty of every student to remain focused on academics with interest in sports and other extra curriculum activities, he added. The Governor also advised the teacher to give their students knowledge beyond the textbook and be friend, philosopher and guide to the students. Visiting the Community Health Centre, Namsai, the Governor met the medical officers and nursing staff. Along with First Lady of the State, the Governor distributed fruits to the indoor patients. They also visited Govt. ANM School, Namsai and met the students and faculty. Before returning to the State Capital, the Governor met the heads of security forces at Namsai. The Governor advised them to make a concerted effort in insuring peace and good social order.